On behalf of our entire team at EXACT Sports, I am excited to announce a new partnership for EXACT Sports with Fields of Dreams Uganda. Fields of Dreams Uganda is a nonprofit organization whose mission is to provide hope to the orphaned and vulnerable children of Uganda through the vehicles of soccer and education. 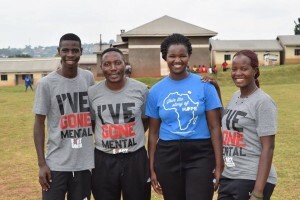 We launched the partnership last month with a kickoff donation to support the Holiday Hygiene Drive, and over the course of 2016, EXACT has committed to donating a portion of every registration for our College Soccer Training Camp programs to support Fields of Dreams Uganda’s incredible work. (From left): Fields of Dreams Uganda staff members Michael Warneke, Jonathan Ssembambulide, and Jeff Oleck. We first heard about this organization from Jeff Oleck, who serves on the Board for Fields of Dreams Uganda and is an Assistant Coach at Northwestern University. 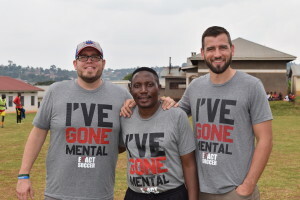 Jeff has been a longtime friend of EXACT Sports, coaching at many of our college soccer ID camps across the U.S., and his passion for Fields of Dreams Uganda’s mission peaked our interest. One story in particular that stuck with us is about a young man named Eddy Ssenkaali. In 2011, Eddy was a young teenager. He had dropped out of school and spent most of his days wandering the streets of Kampala. Eddy was a talented soccer player and dreamed of one day playing for his country’s national team, but he was dealing with a major challenge: Eddy could barely afford one meal per day, hardly enough to survive, let alone train at an elite level. In June 2012, Eddy’s life would change when Fields of Dreams Uganda came to his community to host a soccer tournament. Eddy participated in the tournament and was recognized for being a talented young player; he was placed in one of Fields of Dreams Uganda’s partner schools and with one of their youth soccer teams. Four years later, just this past month, Eddy was hired as a fulltime coach for Fields of Dreams Uganda’s u10 and u12 teams. Thanks to Fields of Dreams Uganda’s programs, Eddy finished his schooling, has a steady job, and now plans to continue pursuing his dream of playing for Uganda’s National Team. Eddy Ssenkaali (far left) is joined by Fields of Dreams Uganda staff members Jonathan Ssebambulide, Florence Ngamita, and Mercy Ajok to celebrate Eddy becoming a full-time staff member. Eddy is just one of thousands of children whose life has been positively impacted by Fields of Dreams Uganda’s programs. Over the course of 2016, I am proud to say EXACT’s contributions will support important programs aimed at empowering young girls, giving Ugandan youth education & technology training, hiring and training teachers and coaches, building soccer fields, funding tournaments, providing equipment, and much more. I will be sharing more stories and updates over the course of the year on our involvement and new initiatives, including ways that you can get involved and help us affect positive change. For more information about Fields of Dreams Uganda, you can visit their website at www.fieldsofdreamsuganda.org.